The American Heartworm Society (AHS), an organization devoted to funding research and spreading awareness about heartworm disease, released its 2016 Incidence Survey findings and the news is not good—per-clinic cases of heartworm are on the rise. The Wilmington, Del.-based organization surveys U.S. veterinarians every three years. 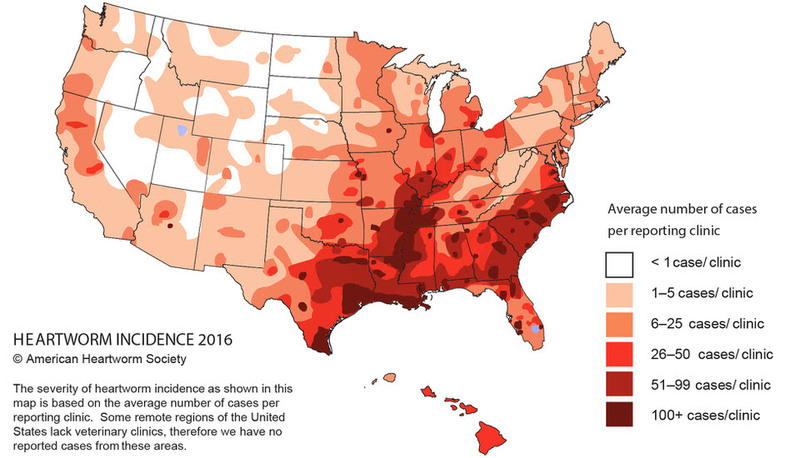 The epicenters of the disease have varied little since the AHA began taking surveys in 2001, with Mississippi, Louisiana, Arkansas, Texas and Tennessee as the top five states with heartworm cases in 2016. Other top states for heartworm last year were Alabama, Florida, Georgia, North Carolina and South Carolina. Among last year’s top 10, Alabama, Louisiana and Texas saw decreases in the per-practice averages of dogs diagnosed with heartworm, while Arkansas, Florida, Georgia, Mississippi, North Carolina, South Carolina and Tennessee saw increases. The average number of dogs diagnosed per clinic in 2016 were almost 22 percent higher than the 2013 survey numbers, according to Christopher Rehm, president of the AHS. Of the veterinarian surveyed, roughly 23 percent reported seeing more heartworm cases in 2016 than they did in 2013, while nearly 20 percent of respondents reported a decline at their practices. Sixty-four percent of those reporting decreases since the previous survey in 2013 attribute it to a change in pet owner protocols, including an increased usage of heartworm preventatives. About 48 percent of veterinarians who experienced upticks in heartworm from 2013 believe the failure of dog owners to use preventatives, skipping doses or not giving preventives throughout the year were factors in the higher numbers. Rehm sees a silver lining in the survey findings. “Veterinarians are telling us that there is a straightforward answer to this: convince more pet owners to use preventives and convince them to protect their pets year-round—with no lapses,” he said.